This PAK-O-BIRD bird carrier is suggested for SMALL BIRDS such as Cockatiels, Small Conures (including Sun Conures), Lorikeets & Lories, medium-size Parakeets, small Amazon Parrots, Pionus parrots, Poicephalus parrots (including Jardine's, Meyers, Senegal Parrots) and other birds of similar size. 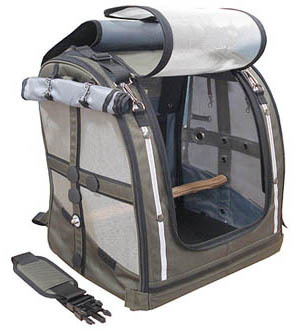 SPECIFICATIONS: Innovative, light-weight and soft-sided bird travel carrier with shoulder straps for front or back carrying. Travel your bird in style with this well designed and attractive travel carrier. Weight - 3 lbs. 13 oz.